It's been a while since I posted and I really want to change that. I would like to be more regular but can't seem to find enough hours in the day. Working and studying is really hard. Anyway, I always put the pressure on myself to be deep and meaningful and I guess that's why I never seem to have the head space to post anything. So today, before I start my work, I'm going to connect with the outside world. I have been waking up at 4am - yes, that's right - 4am!!! With thoughts whirring around in my head. It always happens when I have been either stressed or unhappy. So I figure, if I empty some of what's in my head on here, maybe I can create a better mind space. I have nearly finished my first draft of my dissertation. I have a deadline at the end of this month and I am re-writing all the parts my supervisors have commented on. Yesterday I found a whole heap of new data and now face the challenge of fitting it in to my findings. It's a bit of a slog but I have found a good way to work that is manageable - 45 mins, 10-15mins rest, then start again. It been brilliant for productivity. Funny how I expect my kids to work on the same thing for 45 mins to an hour when I can only just do that myself! Hmmmm. I have put on 10 kilos since getting married. I put on 5 within 12 months and then, when we moved to Christchurch, earthquakes and snow helped me put on another 5. I hate that excuse, but it is sooo true. When you are stuck at home, or in someone else's home, and your basic facilities are unavailable and you are feeling nervous, tired, anxious etc, you do tend to eat things that give comfort and security. The snow didn't make me feel anxious and we did have utilities but I felt all homely and snuggley and just wanted to bake - not an unusual phenomenon apparently; many Cantabs were donning their aprons. So now, I am back on my tried and true eating plan to shake it off. For me, exercise is good, but what I eat is the key. On exercise, that part of my life is really sucking. I have a problem with my hips that has developed. I have been to physio etc and now I'm seeing a specialist. I am praying that he will find what is wrong and fix it. Exercise is a big part of my life and I HATE not being able to do anything. I can't even walk for fitness, let alone run or ride my bike. It bites. Last negative, I'm in a bad space with my job. I think I'm a good teacher but I have major teacher guilt at the moment. My thought life consists of me telling myself what I haven't done for my students, what I'm not good at, and what I should be doing better. I have it on good authority that motherhood can be the same! It is so overwhelming I really just want to run away at the moment. I am working on changing my thought processes and concentrating on what I am doing well. So, on a lighter note, I am growing my hair and am really happy with the decision - hence the photo. Kev and I are going back to Whangarei for Christmas and we have a rental car so we are not tied waiting on someone to give us a ride etc. If we decide to go camping for a couple of days, we can. I am really looking forward to seeing our friends and getting out to those beautiful beaches. I think I'll swim even if it's cold! I am so thankful I have a good job that allows Kev to study and still afford for us to go away for a holiday. Our good friends Ryan and Amy are getting married in December. Here's something funny; Kev and I got married on Dec 19 two years ago this year. I made my own cake (above). My chief bridesmaid and Kev's best man were already married (to other people, not each other). My other bridesmaid got married on our anniversary last year, and I made their cake - same style as mine because they loved it so much. Now this year Kev's other groomsman is getting married the same weekend as us and I am - you guessed it - making the SAME cake! How funny is that? I think it's a cool connection. We are getting a flatmate. He moves in today. It just helps us not be so tight with living costs and we can save a bit more too. I hope it works out well and I don't get selfish and stroppy having to share. Later today I will be making cupcakes for the SPCA fundraiser. I can't have a dog right now so I may as well support them! I am selling them at school tomorrow. Just low key - and the cupcakes probably will be too! Lastly, our marriage is fantastic. It seems to have reached a harmonious place now - which I am loving. Maybe soon I'll be able to write about our first 2 years, but I haven't checked with Kev yet and I'm not feeling deep enough anyway at the moment! Let's just say I am now in a place where I am truly falling more in love with him - not everyday, but most days, instead of wanting to slap him! On that note, go hug someone and have a good week! It's hard during those times when the mind is so full. I've definitely been there before. 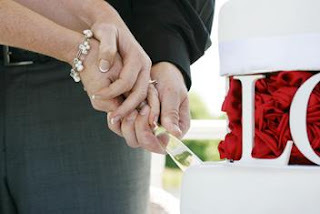 That's so neat about the wedding/cake connection you share with your friends! ..And I know what a pain the hip trouble can be. My hips, feet and legs are a mess. No fun.